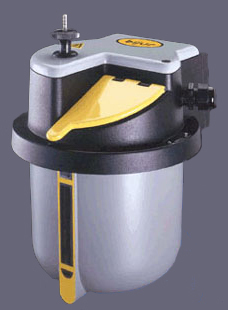 The Bijur X-Series TM-5 is an automatic cyclic piston pump designed to be used with Bijur type "F" meter units. The output volume is adjustable and can set by turning the knob on the top of the unit. The pump comes with a rugged 2 liter plastic reservoir with larger fill cap for easier refills.